One more interesting tidbit about the Acer PQSERVICE partition... it is actually just a rebadged NTFS partition. In fact, you can also use MBRWizard to gain direct access to this partition from Windows by changing the partition type back to NTFS. Make sure you download MBRWizard 2.0b, as this version has the required functionality. - mbrwiz /part=x /type=7d where 'x' is the number identified from the previous step. Now, simply reboot and Windows will assign a drive letter for direct access to this partition! Cheers for the tip JimmyB! I wanted a solution which didn't involve changing the MBR, but thanks for the details, if I ever need to directly access it, I'll follow your detailed instructions. But, how i use the image i just create in case i need to use for restore?? is there a way to make booteable this backup from a pendrive??? jefferson_frantz, first of all cheers for the comment! I don't think you would want to make it bootable, I don't think that's the idea of it. If the windows install gets corrupted but the disk is fine then the standard Alt-F10 on boot up should give you the option to restore from the hidden partition. I took the backup image in case this hidden partition got corrupted or the whole disk broke. Ah, I read this too late. I bought an AA1 with WinXP today with the plan to install Linux on it and use it as a cheap file/mail/webserver. I did keep the PQSERVICE partition (just in case) but unfortunately the Linux installation installed GRUB as MBR, overwriting the original Acer master boot record before I could make a copy. Is there any chance that you could make acer_aspire_one.mbr file available for download? Andrew, thanks for your effort! seems a little bit simpler here ... I used Macrium to back-up the PQSERVICE patition, then booted with the recovery CD, then restored the partition in the first 4 gigs, with clicked 'restore MBR' from backup. Interesting post. It inspired me to take some steps further for backing up and restoring the partition and making a post with the process involved. Just visit my blog. I use Norton Ghost 15. After booting NORTON Boot CD (using an external CD drive), on Utilities tab, select Partition Table Operations. On next screen, select device \\.\PHYSICALDRIVE0 (149GB) and click on View/Edit and click Next>. On first row change the type from 12 to 0B (partition COMPAQ test type to FAT32). Click Next> and confirm the changes. At this point, Ghost can see the hidden drive. 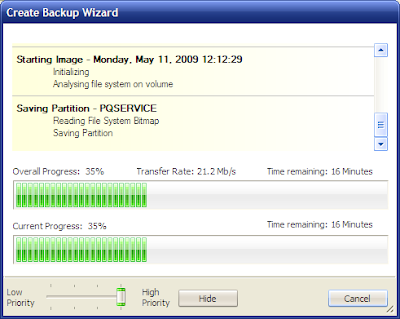 Do the backup of PQSERVICE partition as a normal drive. At the end, don’t forget to undo these changes, and put again the partition type equal to 12. I only did the backup, but did not have the necessity (yet) to test the restore of the disk using this method. Since I can see the existing files on the Ghost image I assume the restore will work. Thanku so much for the above post. 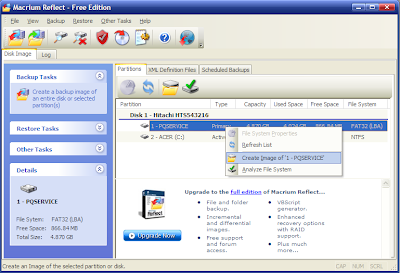 I have created backup of PQSERVICE and mbr as you have described. But i am clueless as how to use them on a new hard drive to create the auto recovery feature. Please guide me. Thanks in advance.